I know there are many of us in the gluten free and coeliac community that are fans of the Discovery Mexican range with their handy gluten free labelling. Recently I noticed that Sainsbury’s had stopped stocking the excellent Discovery Taco Trays, and when I tweeted them about this I was informed that they were no longer produced. A quick investigation via Google revealed that all the Discovery products are being re-branded as Santa Maria UK. Santa Maria do still make a taco shell and they have confirmed to me that this is gluten free. I’ve put in a product request to Sainsbury’s so fingers crossed (UPDATE 02/07: Taco Shells now available at Sainsbury’s Plymouth Marsh Mills!). 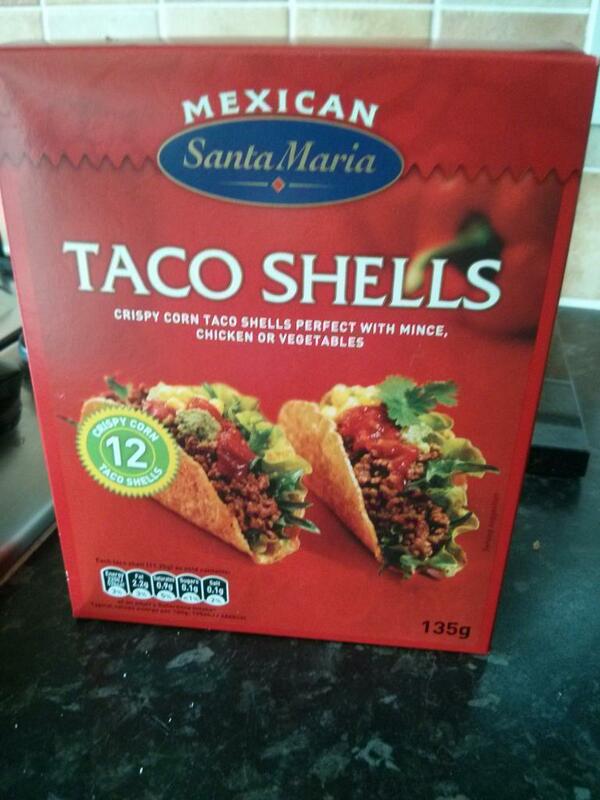 Thanks also to @Kazzy_P who tweeted me to say she had spotted the newly branded Taco Shells in Morrisons, and they are indeed labelled gluten free. Q: Why are the previously gluten free products no longer carrying the Coeliac Society logo? A: Santa Maria follows the EU regulation. According to the EU regulation the limit for gluten free is < 20 ppm (mg/kg). Furthermore it is not allowed to mark products that normally don’t contain gluten as gluten free, like jalapeños, salsas and seasonings, due to the risk of misleading the consumers. The Crossed Grain symbol can only be used on processed products with multiple ingredients. Naturally GF unprocessed products can’t be certified. Some of the Santa Maria products are naturally GF and unprocessed in nature (eg jalapeños) so we can’t certify these. Any products we can certify (eg salsa, spice mixes) have been certified. So it seems Coeliac UK agree with my opinion, and @David_Navigator was quick to point out, the jalapeños contain pickling ingredients and so are actually processed in any case. At this point Coeliac UK agreed to follow up with Santa Maria UK directly, so thanks to them for their help with this. The Santa Maria customer service rep I’ve been speaking to has told me they have been inundated with queries about this, and suggested that the more people who get in contact then the more likely it is that the gluten free labelling will be restored. If you’ve been affected by this change then please get the message over to Santa Maria either by Facebook or email at feedback@santamariaworld.co.uk. A big thank you to Naomi at Santa Maria who has been extremely helpful so far, and even went off and found my Seabrook blog post and has used this to give feedback to a higher level on why gluten free labelling is so important to us. I emphasised that if a product used to be labelled gluten free and is no longer then we lose trust even if there is no actual change to the product itself. Naomi has confirmed that Coeliac UK have been in touch and is hopeful the GF labelling can be restored soon. In the meantime Naomi has been kind enough to send me this list showing which products were labelled gluten free as Discovery Foods (DF), and which ones are labelled gluten free under Santa Maria (SM) branding. So overall disappointing news, but so far great customer service and lets hope the gluten free labelling is soon restored to all applicable products and they can go back to being one of my GF hidden treasures. I should also point out that there are a good number of products still certified gluten free, and well done to Santa Maria on that. This appears to be confusion over labelling rules than anything more sinister. Anyway, wish me luck in tracking down some taco shells, and hopefully we’ll soon be toasting a Seabrook style victory with tacos made with some certified gluten free taco spice and Abby’s refried beans. I’ll be sure to update this post as and when I receive further responses. My wife Abby is from America, where Mexican food is as common as the good old chippy in England. So since we met 10 years ago Mexican food has been a regular feature in the Gollop household. Fortunately Mexican food is easy to make gluten free, thanks largely to Discovery Foods great range of products – many of which are labelled gluten free. We frequently use the taco trays to make quick and easy tacos. Stir fry some onion and peppers with some mince or chicken with one of the spice mixes, serve with some grated cheese and salsa and you have a tasty meal in minutes. Slightly trickier to find are gluten free tortilla wraps. There are solutions though. My first taste of gluten free tortilla wraps was the Lovemore version from Asda. Quite possibly the worst gluten free product I have tried, like eating old leather boots and not something I would recommend! Hope was restored though when we successfully tried this recipe from The Gluten Free Student Cookbook. One of the most popular GF wraps amongst the gluten free community are the corn wraps from Mexgrcoer, and these are really nice (though only 6 inch diameter). I’ve also had success with the Cool Chile Co wraps that are available in Whole Foods. Another option is the easy mix available from the Foodamentalists, which is also available at Plymouth Greengrocer for Plymouth based readers. Whether it be tacos, fajitas or quesadillas, no gluten free Mexican meal in our household is complete without Abby’s Mexican bean recipe. These can also be re-heated in a microwave and can be perfect for parties to dip your tortilla chips in. Based on classic Mexican refried beans, this recipe has evolved over time to use black beans instead of pinto beans. They are much more readily available in tinned form, which makes this a simple recipe. We have tried in the past with dried black and pinto beans and have never really had much success. 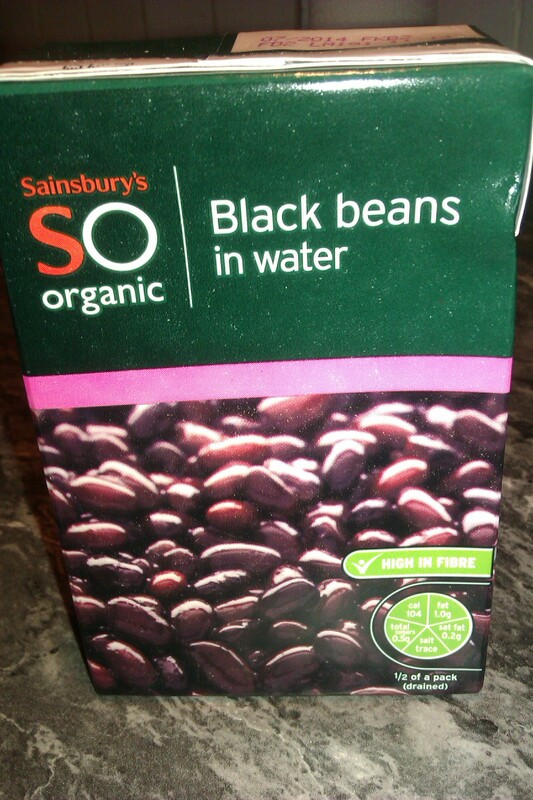 The caramelised red onion, garlic, white wine vinegar and lime juice infuse to give these beans an extraordinary flavour. We usually serve as a side dish, but a friend we passed the recipe onto made them and just served with rice and really enjoyed it. 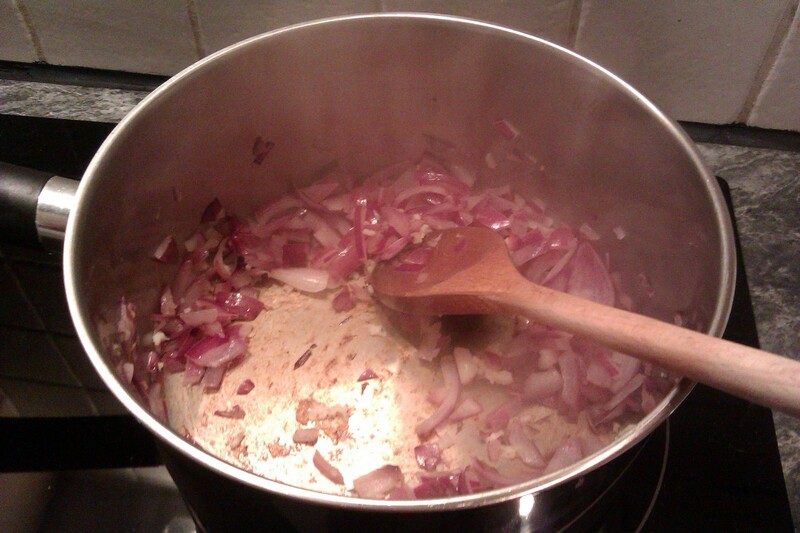 Fry the red onion and garlic in a pan with a tiny bit of olive oil. 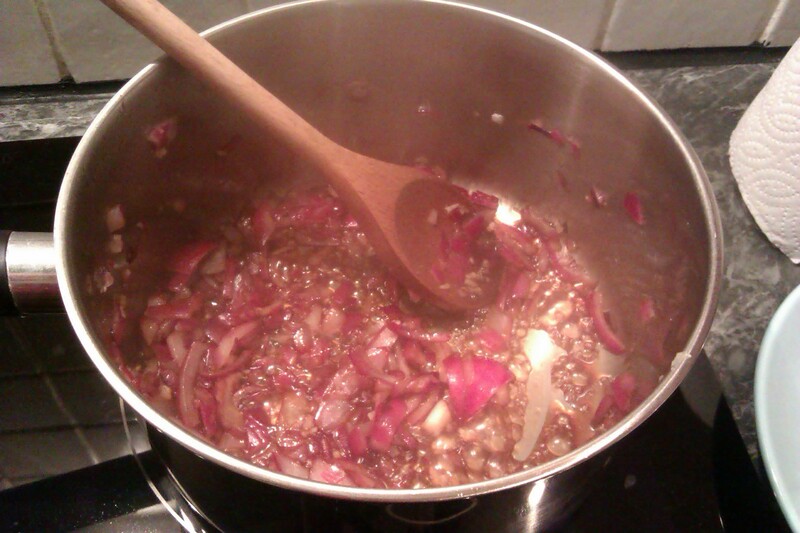 Next add the vinegar and brown sugar and cook until the onions are caramelised. 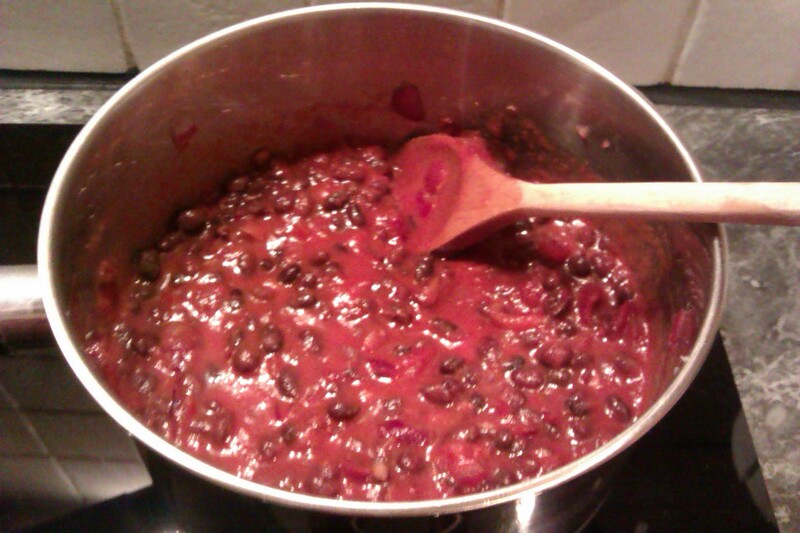 Stir in the black beans, passata, lime juice and add some salt and pepper to season. 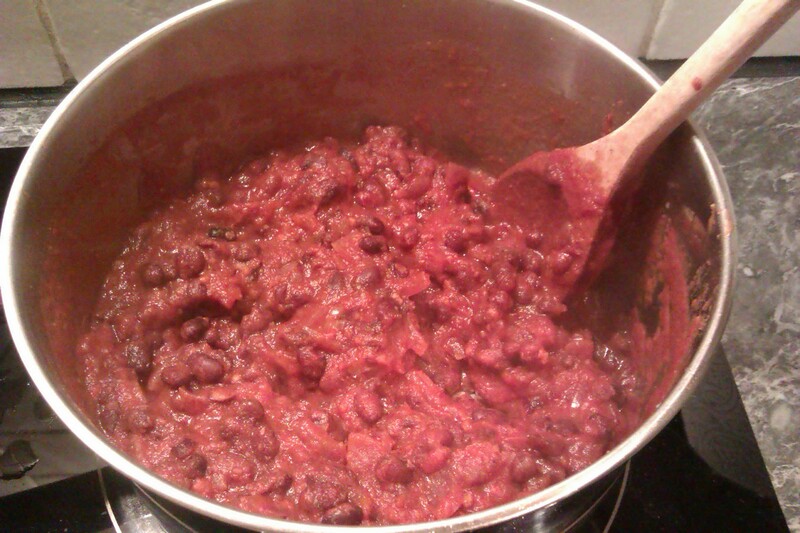 Simmer for 20 minutes until thickened, or longer depending how mushy you like your beans. Hope you enjoy and we’d love to hear from you if you try these.